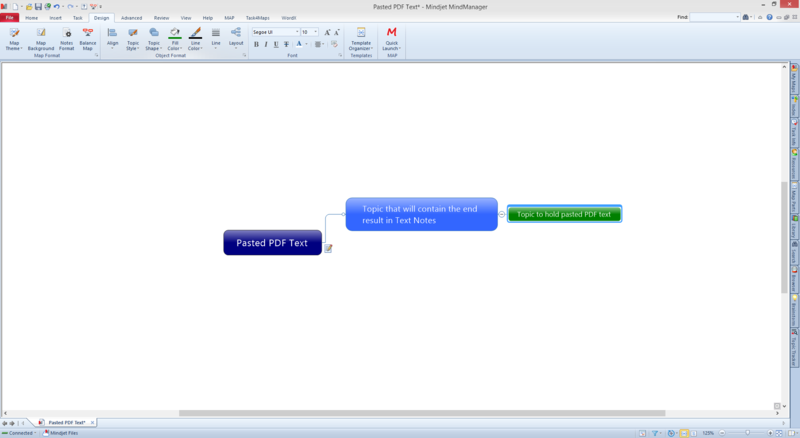 When pasting text from other document formats, particularly PDF’s, into Mindjet MindManager Maps you will often get a collection of text lines separated with hard carriage returns rather than a neatly formatted paragraph/sentence. 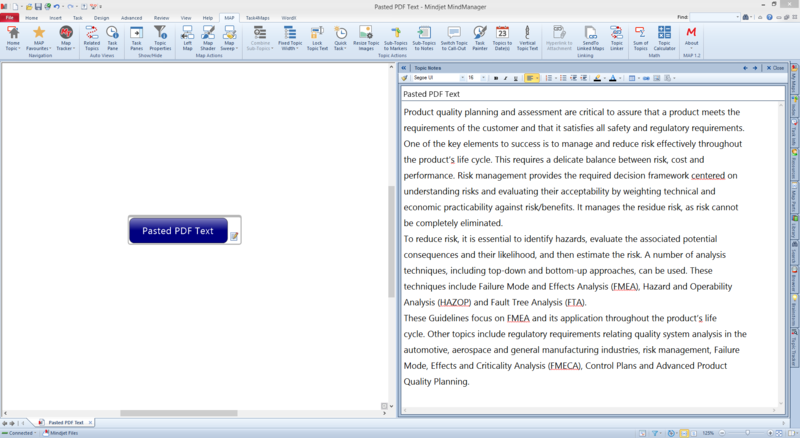 The example below shows a section of text cut from a PDF and pasted into the Topic Notes of a Map to demonstrate this. We can go through the text and manually re-format it by deleting these unnecessary carriage returns but if you have a large volume to do this can take some time. Time that could be better spent on the next task. So is there a better way to handle this situation? The answer to that question is YES! 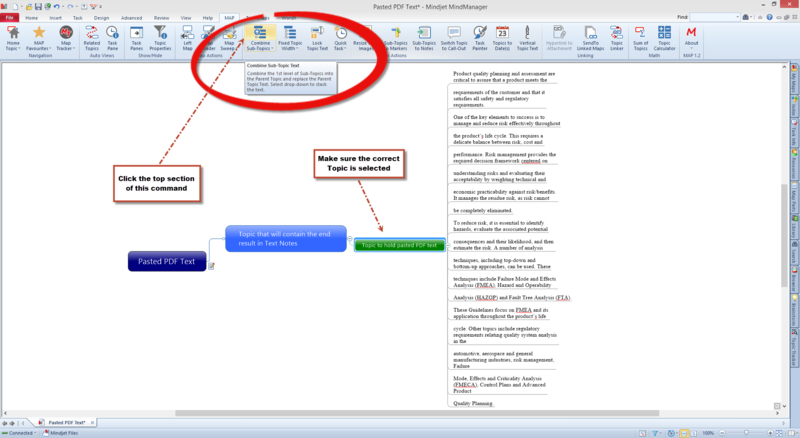 MAP for MindManager contains two useful commands that will help you cut down the time required to achieve nicely formatted, pasted text in a few seconds! Set up the Map Topics that will hold your pasted text. You need to create two new Topics. The first will be the Topic that will ultimately end up containing the Topic Text Notes (this is the Blue Topic), the second is a temporary Topic that is used to paste the text onto (the Green Topic). You can name the second Topic anything you like or leave it as the default Topic name as this will be removed in a later stage in any case. Once you have created your Topics, select the Topic that will be used to capture/hold the pasted, the Green one in our example, text and paste the text into the Map. If you are cutting/pasting a large volume of text it may be best to do it in several passes to make it more manageable. The process will append the text to existing Text Notes for each iteration. 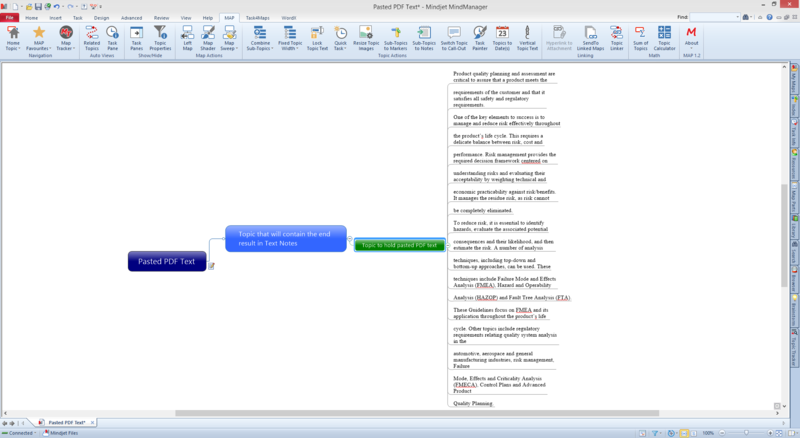 Once you have pasted the text onto the Topic, you will use the Combine Sub-Topics command from the MAP for MindManager menu. This command has two possible methods of application but for this example we will use the default method which is accessed by clicking the top section of the command. 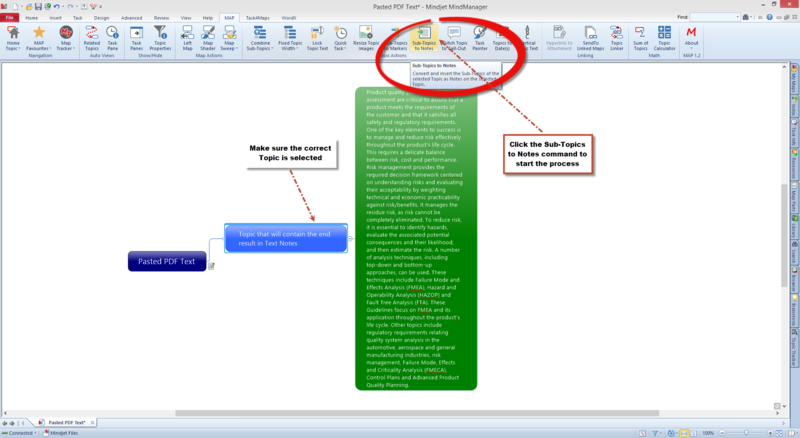 Make sure you have selected the Topic that holds the pasted text before clicking the command. Once the process completes you should have a single Map Topic with all the pasted text combined and all the carriage returns removed. You are now set for the second step. 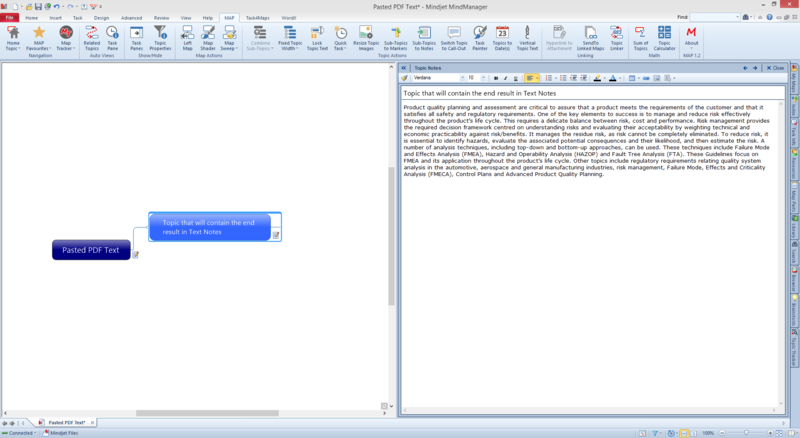 We now use the second MAP for MindManager command, Sub-Topics to Notes, to convert the selected Topic and its text to Text Notes contained within the Topic we wish to hold them, the Blue Topic in our example..
Once you have run this command the Topic Text will be used to create the Topic Notes on the selected Topic and the original Topic will be removed from the Map leaving you with a nicely formatted, carriage return free paragraph. All that is left to do is remove the blank line from the head of the Text Notes, delete the paragraph number and insert the paragraph breaks where you require them. Combine Sub-Topics & Sub-Topics to Notes are just two commands from a collection of 25 that currently make up MAP for MindManager. To learn more about this No.1 companion to MindManager check out the dedicated MAP for MindManager website, www.mapformindmanager.com, for details of all 25 commands and recent updates. 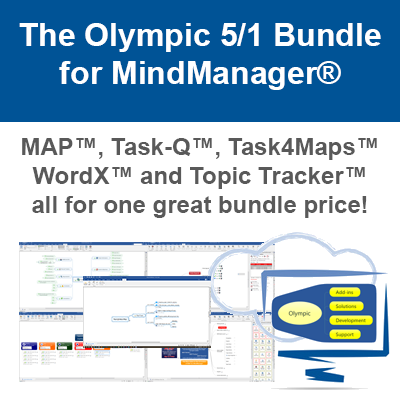 MAP for MindManager is also updated monthly with new commands and/or content so the add-in keeps delivering value way past the point of initial purchase. It also includes 350+ Icons/Images you can use in your Mindjet MindManager Maps to add impact and stand out from the crowd. 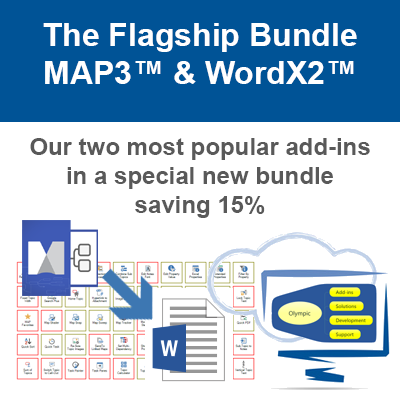 We are pleased to announce that MAP for MindManager can now be purchasedthrough UK resellers via Sigma Software Distribution. Contact your reseller today for details of volume / individual pricing.